Go to prop. 2: Circles are to one another as the squares from the diameters. Prop. 1: Similar polygons in circles are to one another as the squares from the diameters. (diagram 1) Let there be circles, ABG, ZHQ, and in them let there be similar polygons, ABGDE, ZHQKL, (diagram 2) and let there be diameters of the circle, BM, HN. I say that it is: as the square from BM to the square from HN, so polygon ABGDE to polygon ZHQKL. (diagram 3 = gen) For let BE, AM, HL, ZN be joined. (diagram 4) And since polygon ABGDE is similar to polygon ZHQKL, the angle by BAE is also equal to that by HZL, and it is: as BA to AE so HZ to ZL. (diagram 5) In fact, two triangles, BAE, HZL, having one angle equal to one angle, that by BAE to that by HZL, but about the equal angles the sides are proportional. Therefore, triangle ABE is equal-angled with triangle ZHL. 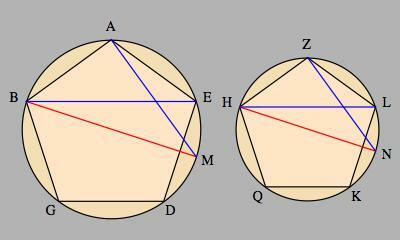 (diagram 6) Therefore, the angle by AEB is equal to that by ZLH. (diagram 7) But that by AEB is equal to that by AMB. For they’ve stepped on the same circular-arc (iii def. 9 and III 27). And the angle by ZLH is equal to that by ZNH. Therefore, that by AMB is also equal to that by ZNH. (diagram 8) But a right-angle, that by BAM, is also equal to a right-angle, that by HZN. (diagram 9) Therefore, the remainder is also equal to the remainder.Therefore, triangle ABM is equal-angled with triangle ZHN. (diagram 10) Therefore, proportionally, it is: as BM to HN so BA to HZ. (diagram 11) But the square from BM to the square from HN is duplicate of the ratio of BM to HN, while the ratio of polygon AMGDE to polygon ZHQK is duplicate of the ratio of BA to HZ (VI 20). Therefore, as the square from BM to the square from HN, so too polygon ABGDE to polygon ZHQKL. Therefore, similar polygons in circles are to one another as the squares from the diameters, just what it was required to show.